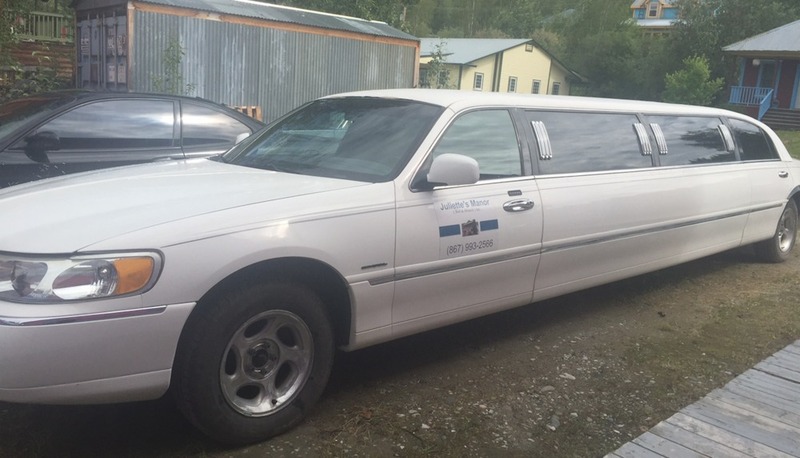 Juliette's Manor, offers Dawson City's only limousine service! 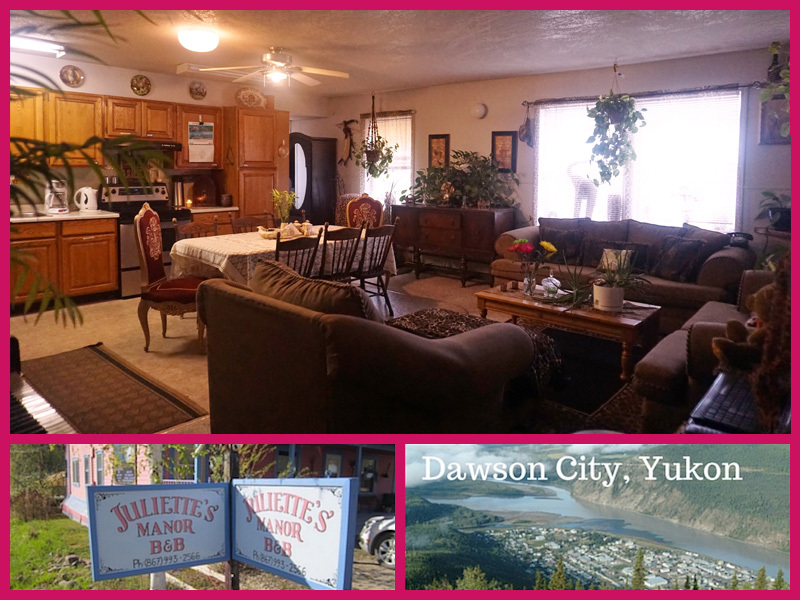 Special rates for Juliette's Manor B& B guests. Online booking unavailable at this time. Please read the following prior to booking. For inquiries please contact us via phone or email. This is a professional limousine service & NOT a taxi company. These terms have been designed to safegaurd our business ethics, and help us to maintain an efficient & proffesionalservice for our clients. These terms apply no ,atter how the contract was made, in writing or verbally on route. All bookings must be 24 hours in advance or at the descretion of the owner. By making a booking & paying the deposit amount(s) the client acknowledges & expressly agrees to the following policies, terms & conditions and further expressly authorize charges to your credit card in full or in part amounts related to your booking. Bookings must be secured with a credit card & signed contract. Note: Due to the length of the stretch limousine, access to the ferry, some streets/driveways & rural areas may be restricted & pick up/drop offs may not be achievable. We reserve the right to NOT proceed where proceeding may place the vehicle and/or patrons in an unsafe situation. The agreed price is the price to be paid for the pre-discussed journey. Any charges including additional drop off or pick up points may result in additional charges to the customer. Any additional charges will be notified to the customer at the time the requested changes are accepted. Chauffeur gratuities are not included in the price. Customarily gratuities are to be offered directly to the chauffeur. The agrred price is due for payment at gthe time & place of the first pick up on the day of hire. Additional charges for additional services (or damages) will be paid at the final drop off location or the credit card on file will be charged. All cancellations must be recieved withinn 6 hours of the pick up or a $50.00 fee will be charged to the credit card on file. DAMAGES: subsequent cost's of repair's of such damages to the limousine as used by you the customer and/or your guests howsoever caused is your responsibility. Body and/or interior equipment will be estimated by a proffesional establishment and all charges are the customer responsibility, and may result in the credit card on file being charged. In the event that one of your paty is sick or soils the limousine the cleaning charge is $300.00. You, the customer here agree that the amount will be charged to the credit card of file for ANY damages that occur. Addition $200.00 fee for smoking in the limousine. $30.00 for each broken or missing glassware. Contro s in the rear of the limousine for windows, stereo, heat etc will be reviewed with the customer at the time of pick up. Damages include but not limited to: gum, wine/alcohol spillage, vomit, breakage of glassware, breakage of lights, tv, radio, cd player etc. Repair & replacement of items will have a MINImum charge of $250.00. The Chauffeur reserves the right to expel any person from the vehicle and/or terminate this contract in the event of a vio ation of any of these conditions by any passenger. In the event of such early termination, no portion of the rental fees shall be refunded & any damages will be charged to the credit card on file. Unacceptable behaviour includes but is not limited to: over intoxication, rough housing, standing on seats, endangering themselves or the Chauffeur, verbal or physical abuse of the Chauffeur, smoking inside the limousine, clients cannot be located withing 1/2 hour of pre-arranged pick up, excessively inappropriate behaviour, non payment, damages, exiting the vehicle in part or whole while in motion (sunroof). If the limousine is to be for minors (under 19) this agreement must be signed by a parent or legal guardian. This limlousine has the seating capacity for a maximum 6-8 people (at owners discretions) - No exceptions.